Roman Vessel Europa -X Large 9 litters (Vitos Keramia) has a rating of 0 stars based on 0 reviews. 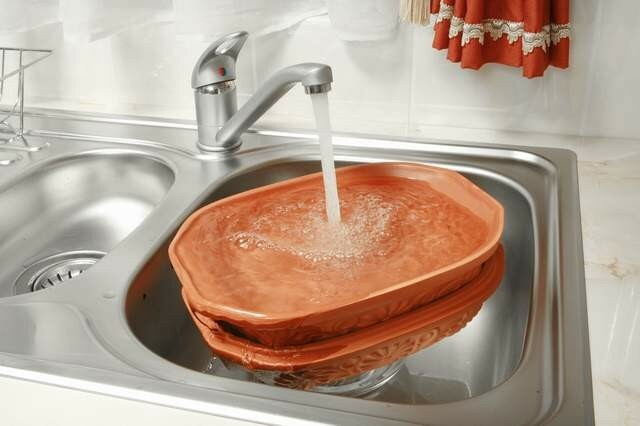 In the Roman Vessel you can prepare very delicious dishes. The food that is being prepared in the oven does not need to be checked very often. The meal steams in its own juice. For its preparation no oil of fat is needed. The dish taken out from the oven can be served up in the same plate. You have made the right choice! You will be satisfied with the quality of our product. Measurement in 44 X 32 X 18 cm. Ceramic pots work like magic. The food that comes out of the Tal is filled with flavor and is very juicy. Usually when cooking meat in the oven it tends to become very dry because all the water has evaporated. When using the Tal you soak it in water for 20 mins. The pores in the Tal absorb water. So when your dinner is cooking it stays very juicy and preserves its original taste. The Tal is glazed in the inside which makes it easy to clean and the different aromatic substances of subsequent cooking sessions do not get mixed. 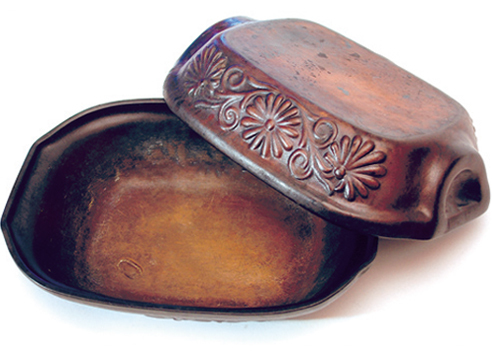 Our baking dish is made using only natural raw materials and preserves the original taste,nutrients and vitamin content of the food during the cooking.This kitchen tool is recomended for those who favour fat free cooking,but may also be used for the traditional recipes of the hungarian cuisine. 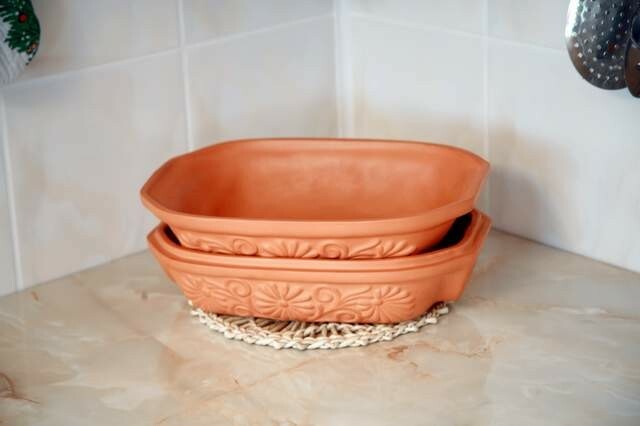 Why are Roman pot or otherwise clay roaster vessel? Because you can bake it without fat, so the food is much healthier and low calorie. It is important that before each dish soak in cool water for 20 minutes, so it can absorb water, which then evaporates during baking. Do not put not soaked the pot in the oven, it may burst, also with extreme changes in temperature - do not put a cold pan to very hot oven. 1)Soak the vessel for about 15-20 minutes. 2)Put the food into the vessel. 3) Cover it and put it in the oven. 4)Place the vessel onto a plank after taking it out from the oven. The finds dating back to the Roman period prove that the usage of the earthen vessel goes back to ancient times. They appeared on the pages of old cook books, but we can also recall our great-grandparents praising the meals prepared in the oven and in earthen vessels. This vessel has passed the test of all times. No wonder that it has been re-discovered by the modern cooking techniques. The meat prepared in the vessel does not get dry and it keeps its own aroma and taste. 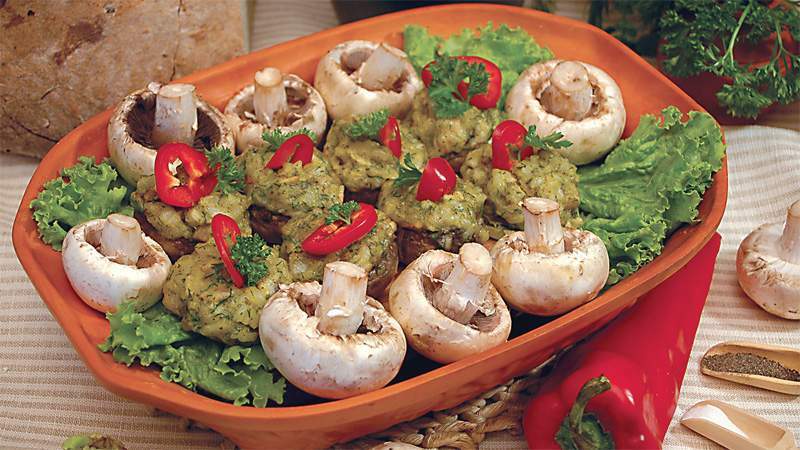 The vegetables retain more of their vitamins and minerals than as if they were boiled. 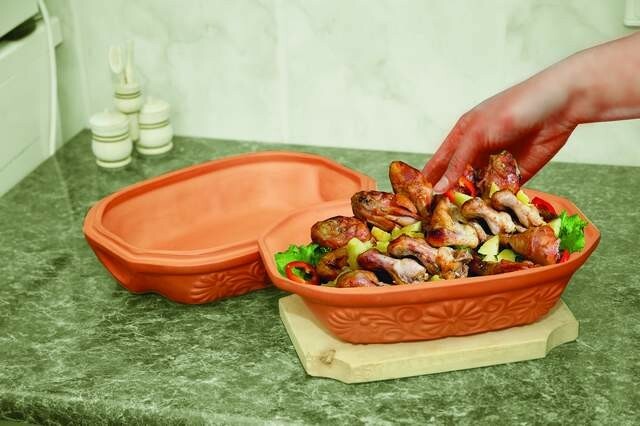 In the Roman Vessel the meals are prepared without fats or oil, therefore it is healthier than using regular bowls. As a result, people on a diet can also enjoy the adventure of the different flavours. The porous structure of the vessel allows it to absorb water. During preparation this humidity will produce steam inside the vessel. The product disposes of the Quality Certificate nr. 2061/1997 licensed by the Ministry of Public Health and corresponds to the sanitary norms nr. 708/1/91 and 3281/75. The quality of our product was also examined by the Public Health Section of the Consumer Protection from Geneva where it was licensed for the preparation of food with order nr. AN-06/20.031. 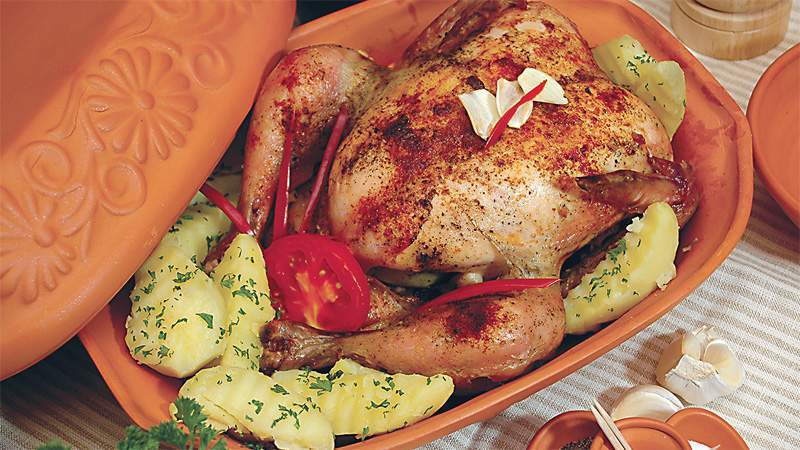 Ingredients:1 chicken, salt, pepper, paprika and garlic. Preparation:eason the chicken with salt, pepper, paprika and garlic. Put the chicken into the soaked vessel and cover it. Stew the chicken until it is soft and then remove the cover and let it roast till it becomes crispy red. 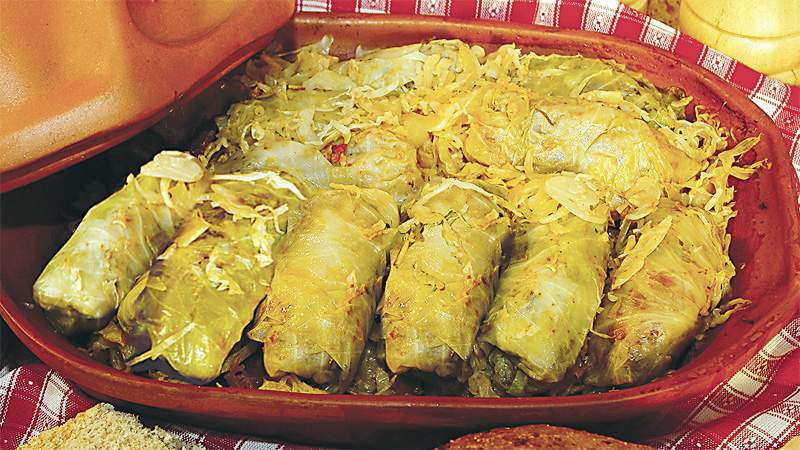 Ingredients: 1.5 kilo of cabbage, 40 dkg of minced pork, 25 dkg of bacon, 5 dkg of rice, 1 onion, salt, pepper, chili. Preparation: Remove the stalk of the cabbage, scald it with hot boiled water and take its leaves off. Season its middle thick vein with salt and pepper. Put a thin slice of smoked bacon and some stuffing on each leaf. Roll the leaves up steadily and place them into the soaked vessel and boil it in water in the oven. Supply the evaporated water with hot water. The stuffing: knead together the minced pork meat with the steeped and squized rolls. Add some salt, pepper and garlic. Preparation: Put one teaspoon of salt into the water. When the water is boiling, pour 1 kg cornflour into it and boil it hard. Cut the bacon into small squares and fry them in a frying pan. 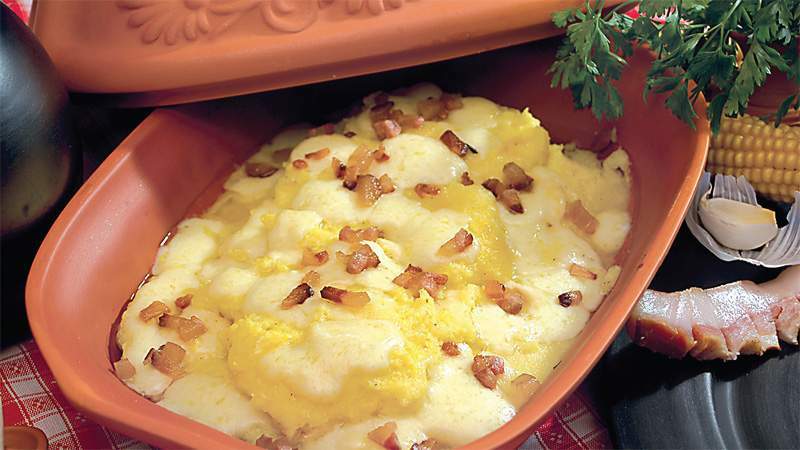 Put a layer of bacon, then a layer of polenta and finally a layer of cottage cheese into the vessel. Put some bacon on top of the polenta, too. Bake it for 10 minutes. filling and put them into the vessel. Bake it for 20 minutes.